I have some more blocks done in KFC - Kaffe Fasset Collection. They are also part of the block exchange. 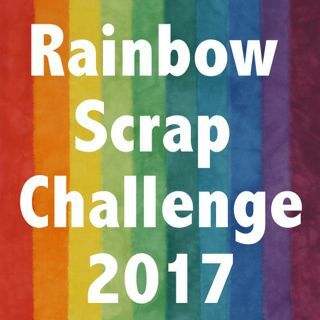 I kind of did an oopps last week. I mailed the last set of blocks to the wrong person. She is forwarding the blocks on to the correct person, so I have made her an extra block, 3. I have had some trouble reading the patterns. This pattern gave me the most trouble. I did the purple and green block 3 times before I got the block the correct size. The other 2 are too small. The bottom star is from earlier on. I will save these for some kind of mixed up quilt. 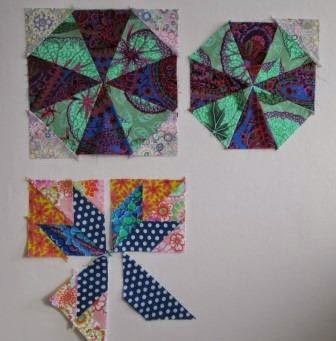 I have so many miss matched blocks I am sure there will be more then 1 miss match quilt. Last week our Leduc guild did a little block making demo for program. We had 4 tables set up each with a different block. 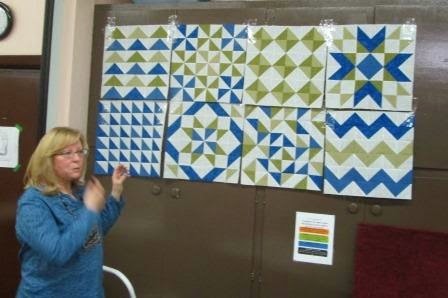 Brenda our guild President did the 8 easy triangles and then made all these blocks with the method. So really she showed us so many more blocks. She drew on the back of the light fabric a grid with the cut lines and the sew lines. Then you sew then you cut then apart. Lots of triangles. I needed a photo of all her pretty blocks. I have always loved how much you can do with triangles. This year I am on the program committee, I am in charge of the Quilt Till You Wilt Weekend. I am also second to help out with a few other things like the retreat. I will help take the guild ironing boards and irons and step in if our leader should need help. Wow! Lots of great blocks with triangles. The KFC title had me thinking of Kentucky Fried Chicken! Your 'miss match' quilt will be lovely. Cathy, your KFC blocks are very interesting. I too would have more than one "Miss Matched" quilt in my closet. And I LOVE what Brenda has done with a pile of triangles. 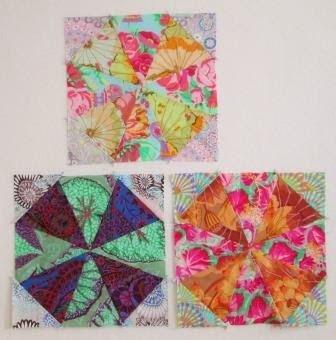 Love your KFC Kaleidoscope blocks - their fabrics can be used , I think, in any block and still look a million dollars!